We are excited to announce that the Sting 25 iPad app has been awarded a Mobile Lions Silver Lion for Best Visual Design / Aesthetic as part of the Cannes Lions International Festival Of Creativity! The Sting 25 'appumentary' explores the life, music and activism of one of the world's most influential musicians. 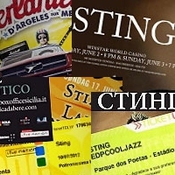 With unparalleled access to seminal performances, including exclusive concert footage from Sting's Sixtieth Birthday Celebration to benefit the Robin Hood Foundation, rare photos and personal stories, the comprehensive app depicts the past 25 years of Sting's enduring solo career. The free Sting25 app is available for download in the iTunes store. Get it now at www.itunes.com/appstore. I would like so much to see the application Any chanche to see it on a computer too ? It sure is a great app! My suggestion is to use it for new items also. Latest items are from 2011 and it would be great to see more news, vids, music of 2012 also.